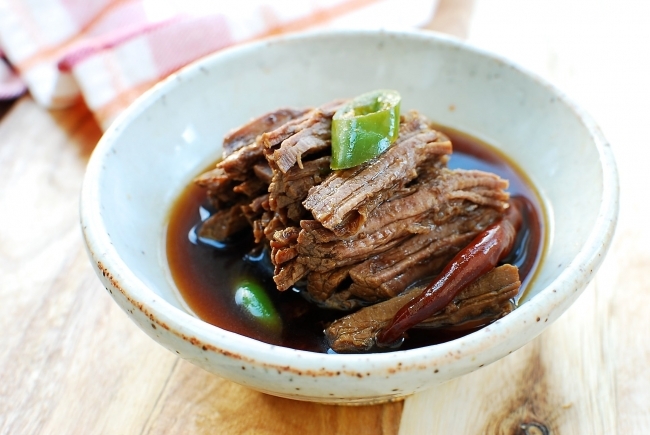 Jangjorim is a soy-braised beef dish. 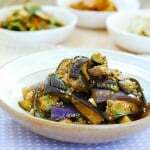 It’s a slightly sweet, salty side dish that goes well with any Korean meal! 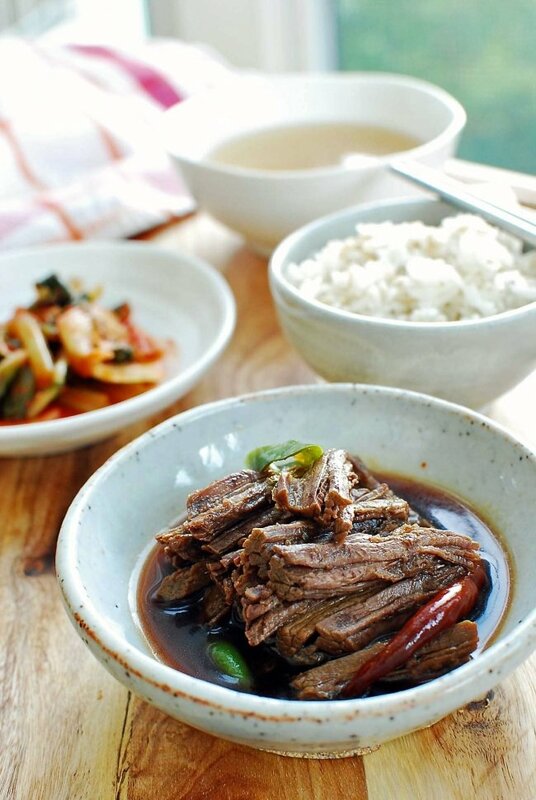 Jangjorim (장조림) is a soy-braised beef dish. 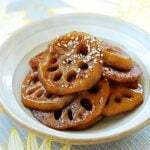 It’s a slightly sweet and salty dish that’s meant to be eaten in small amounts as a basic side dish, mitbanchan (밑반찬). So, a little bit of meat goes a long way. 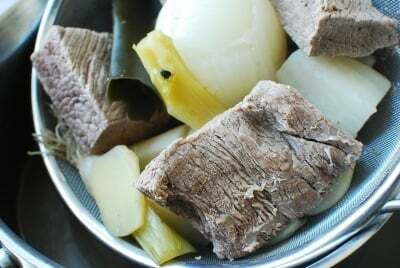 Back in the day, when beef was scarce, jangjorim was an economical way to put some beef on the table for the whole family. 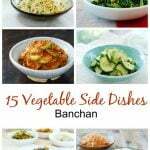 It’s also a popular side dish for home-packed lunch boxes. Kids love it! Growing up, it was the most exciting thing to see in my lunch box. Beef eye round is commonly used, but I prefer brisket or shank because they are more flavorful. 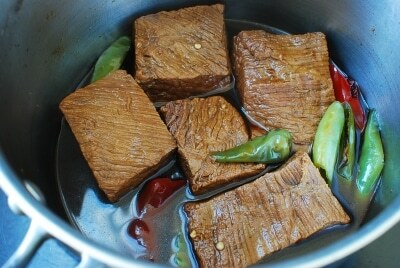 First, cook small blocks of beef in water, along with a few aromatic vegetables, and then cook in soy sauce based broth. 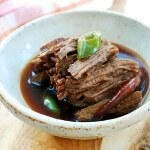 The beef will turn tough if cooked in soy sauce from the beginning. 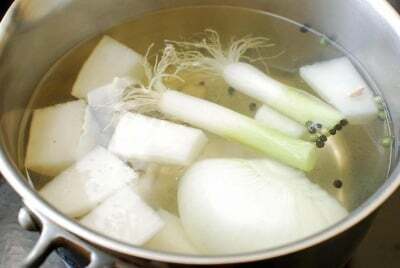 I boil the aromatic vegetables, to make a flavorful broth, before adding the beef to cook. Shred a block of beef or two and pour the sauce over to serve. 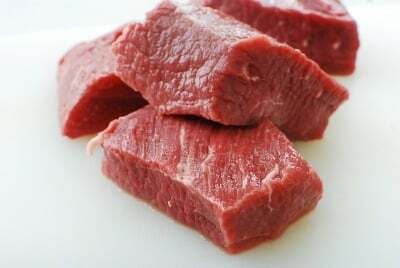 Cut the beef into 2 to 3-inch rectangles. In a covered medium pot, bring 6 - 7 cups of water and the next 6 ingredients to a boil. Continue to boil for 5 minutes. Drop the meat into the pot. Bring it to a gentle boil, and remove the scum. Reduce the heat to medium low. Boil, covered, for about 30 minutes. Add the meat and sauce ingredients. Bring it to a boil. 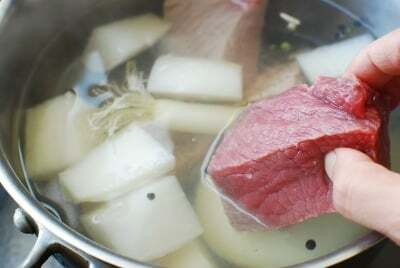 Reduce the heat to medium low, and boil until the meat is tender and the sauce is reduced to about 1/3, about 30 minutes. Add the chili peppers and dried kelp with about 7-8 minutes of time remaining. Remove the kelp, and transfer the meat and sauce to an airtight container. Shred the meat and pour some sauce over to serve. Keep it refrigerated in an airtight container. It will keep well up to 10 days. If you want to keep it longer, boil the meat and sauce again after a few days. The meat will become hard in the fridge. You can soften it by leaving the shredded beef out at room temperature for 20 to 30 minutes, or microwave for 10 - 15 seconds to soften. Sounds delicious! What exactly is “soup soy sauce”? 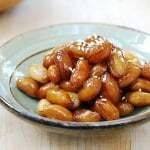 It’s traditional Korean soy sauce that’s made from fermented soybeans. It’s lighter and saltier than regular soy sauce with a deeper flavor. 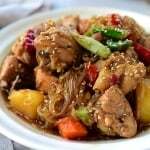 If you don’t have soup soy sauce, just use more regular soy sauce for this recipe. Ohh mouthwatering! I haven’t made this dish in a long time. But now I gotta make it again. So yummy! Totally going to go pick up some meat for it. Thank you, Miss Kim! Hope you make it soon and enjoy. What brand soy sauce do you use? I have a photo of it under the ingredients tab above. Thanks. 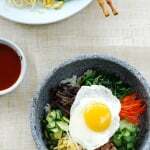 I am very happy and thankful for your website, I am a Portuguese married with a korean man who loves korean food, I am learning a lot thanks to you. Our baby boy will be one year in November hopefully by then I will be able to cook delicious food for his birthday. 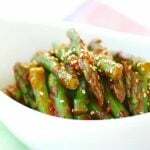 Hi Dalila – So happy to hear my recipes are helping you. I’m sure you’ll be able to make delicious food for his birthday. Cheers! Hi Young mi – Jangjorim is mitbanchan (basic side dish), so it’s good with anything – jjigae, guk, vegetable sides, etc. Enjoy! Hi Hyosun, what kind of kelp do I buy to use here? Is it the same kind as that used in 미역국 (don’t know if I spelled that right)? Can you give me some tips on what to look for? I have both Hmart & Assi stores here. Also, won’t the brisket be tough if cooked only for 1-1.5 hours? 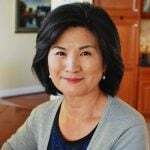 Thank you for all your work in helping people with Korean food. God bless! It should become tender enough with that time, but cook longer if you like it softer. Thanks! I think that korean radishes might be hard to find here. Is there any other vegetable that would be suitable to replace it with? just omit it. It should be fine. Enjoy! Thank you so much for this wonderful recipe! It turned out super delicious. I forgot to put in ginger slices, but it still turned out the way my mom use to make it for me when I was a kid! I also put in some boiled eggs and it came out lovely. You’re welcome! I am happy to hear it was like your mom’s jangjorim. What if I wanted to use a crock pot for this recipe? How would I do it? i was thinking that this might be a great recipe for a pressure cooker like an instant pot. Have you tried it that way? no I haven’t, but yes it should work. If you try, let me know how it turns out. Cheers! Yes it does. It should be okay for 2 to 3 weeks. Hi Hyosun! I’m new to your site and very excited to have found you. All recipes look so appetizing & thorough that I can follow. One question: rice wine, what is it called in Korean? Mirin, I know, is a Japanese version with some additional ingredients. Is it ”Matsul,” Cheongju, or soju? I don’t recall my mom using any kind of wine in her Korean cooking. Thank you. Hi Kay! Traditionally, Koreans use cheongju in cooking, but these days seasoned cooking rice wine (mirin) is also widely used. Sometimes soju is also used. Any one of these is okay to use in the recipe or you can omit. Hi! 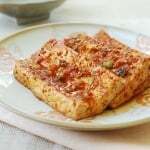 Is there a way to make this in a pressure cooker? I just want to thank you for your recipes!! Very easy to follow and the taste is amazing!! Thank you for the kind words, Grace! You just put a big smile on my face.